Director Nicholas Stoller has a unique mind in crafting films. His two comedy hits Forgetting Sarah Marshall and The Five-Year Engagement are proof the Stoller can cultivate a well-crafted narrative (balancing story pacing and general silliness timing) for a genre that’s made of comedic slapstick. Stoller took a break from directing and participated in writing for films such as 2011’s The Muppets and most recently in Muppets: Most Wanted. Now Stoller returns to directing with comedy movie titled Neighbors. Is this movie destined to become “Best comedy of 2014” or is just another run-of-the-mill comedy that tries too hard to be funny? Having recently become parents, Mac (Seth Rogen) and Kelly (Rose Byrne) are heading into the next stage of life; buying a house in suburbia and raising their young daughter. The couple is sort of reluctant to give up their youthful lifestyle in exchange to being label as “Old People”, but this all changes when a fraternity (Delta Psi Beta) moves into the house next door. Trying to act cool and likeable to their frat neighbors, Mac and Kelly are put to the test by the fraternity’s president Teddy (Zac Efron) and vice president Pete (Dave Franco). While their cohesive relationship is established, it starts to crumble when the couple calls the cops on the frat for thrown a loud party. From there a feud is born; escalating to events of aggressive pranks and neighborly warfare as Mac and Kelly try to find way to get the fraternity kicked out of the house. I remember seeing the trailer for Neighbors in theaters and thought that it looked funny. This, of course, peaked my interest to see Neighbors as I personal can say that I’m a big fan of Stoller’s Forgetting Sarah Marshall. Love that movie and can’t get enough of it. After seeing Neighbors, I found that the comedy movie was pretty funny, but lacks a strong narrative. Given the wildish disbelief and outlandish premise to make the film work, Neighbors is still a very funny movie that truly does pushes the envelope with some gags and pranks that presented in the film. In truth, given the track record for other comedies of 2014 so far, Neighbors is ahead of the pack; wearing the crown for “Best Comedy” of 2014 to date. True, this isn’t groundbreaking material for the comedy sub-genre with films like National Lampoon’s Animal House, Van Wilder, or Old school leading the charge, but the film presents an interesting scenario with Mac and Kelly caught between the world of the lustful immature youths and mundane responsible parents / adults. Still, the comedy is the best part of the film with numerous college style pranks and R-rated humor that are truly a riot of laughs. Seth Rogen is perfect for Mac, ensuring a inherit likability for his character. Again, he really doesn’t bring new, but you just simply root for him as he stumbles and plots with his wife to thwart the brothers of Delta Psi Beta. Rose Byrne is also good as Kelly, conveying that mono-tone stay-at-home mom syndrome and child fatigue, but shines when it comes to plotting and scheming to try break the frat apart from within. In my opinion, Rogen and Byrne might be slightly outshined by a standout performance from Zac Efron. His character Teddy is brash, arrogant, and cocksure; a bona fide meathead college frat boy that shows his hidden insecurities as the film progresses. It’s interesting role for Efron to play and a far distant cry from the character of Troy Bolton from the Disney Channel’s High School Musical. Other notably performances include Dave Franco and Christopher Mintz-plasse as fraternity brothers Pete and Scoonie, Lisa Kudrow as the college dean, Carla Gallo as Paula (Kelly’s sister), and Ike Barinholtz as Paula’s dim-witted ex-husband. Lastly, there’s Elise and Zoey Vargas, who play Mac and Kelly’s young daughter Stella. 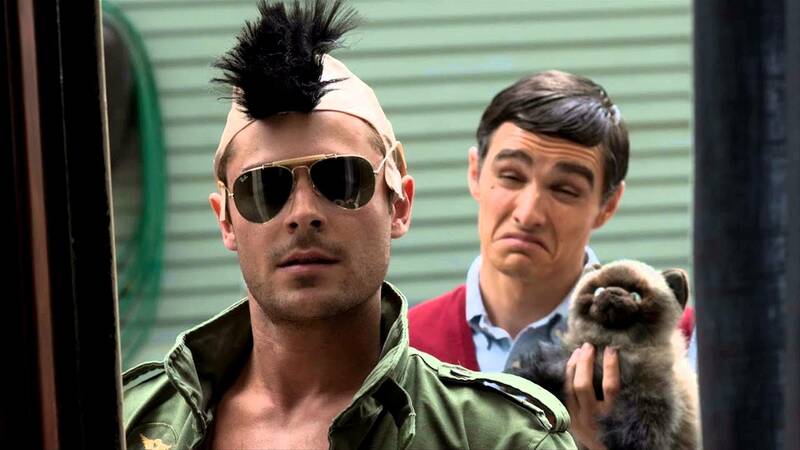 Unfortunately, Neighbors doesn’t strike pure gold when it comes to substance and depth. While Forgetting Sarah Marshall and The Five-Year Engagement measured the perfect balance of story and silliness to harmonize with each other, Neighbors lacks the creative engine that could’ve made the film that much greater. As I said before, while the surreal premise works for the comedy, the narrative isn’t quite the “Hardest hitting” story; feeling deflated and underwhelmed by perhaps too much time devoted for adult humor. Films like The Hangover and 21 Jump Street, both of which are comedies, have wildish narratives to their credit, but have enough substances and material to utilizes a good story and sustain the film from crumbling beneath its overall comedic premise. Unfortunately, Neighbors underperforms in that category; laughing off a good story for chaotic neighborly mayhem. The film also has a roll coaster of pacing problems that make the film uneven at times as high points of the film are dragged down by the numerous lows. It has great moments of raunchy strides that will make you laugh uncontrollably, but then falls short with scenes that try to elevate character problems and revelations that don’t completely mesh well. The movie also feels very long (too long in my opinion), which is strange because the Neighbors only as a running time of 97 minutes. The third act of the movie becomes slightly derailed with a final confrontation between the neighbors that’s escalated in a predictable fashion and one too many epilogues that are unnecessary and simply there more comedy relief. Is Neighbors funny? Yes. Is it Nicholas Stoller’s best picture to date? No. Could it be better than it was? Possibly. This raunchy comedy offers great performances from Rogen and Efron and is filled with adult jokes and gags that deliver a “Shock and Awe” hilarity that will surely make you laugh out loud. Unfortunately, the movie lacks any real depth with numerous pacing problems and perhaps rests too much on its surreal premise to sustain anything above a mediocre narrative. Nevertheless, Neighbors is worth seeing for a good laugh and will presumably play the role as steward; holding the crown for “Best comedy of 2014” (for now at least).